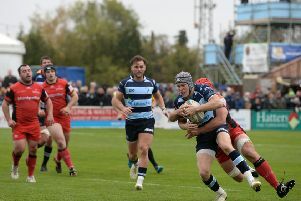 It is a return to action at Goldington Road this weekend as Bedford Blues welcome league leaders Worcester Warriors through the gates on Saturday afternoon. The Blues will be looking to bounce straight back from a disappointing defeat away to Jersey last weekend and they couldn’t face a bigger task than hosting the Championship leaders who haven’t tasted defeat since Round One. Games between the two sides have always been entertaining affairs, but the Blues know that they will have to be at their absolute best to take anything from the game. The reverse fixture at Sixways back in November ended in a 42-12 win for the hosts, but Bedford did score two superb tries through Joe Vandermolen and Dean Adamson. Blues director of rugby Mike Rayer makes a handful of changes to the side that lost in Jersey last weekend, with Viliami Hakalo, Jake Sharp, Peter White, James Currie, Ben Gulliver and Justin Blanchet all returning to the side while Hayden Thompson-Stringer takes a spot on the replacements bench.